This interesting new material from TCI Tang Chen in the Philippines has some interesting possibilities. 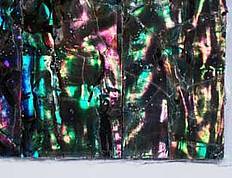 Pearlflex is made from mother of pearl and Paua shell and combines the iridescence of these materials into a flat sheet suitable for use as tiles for home decor, or in fashion as a button or trim material or it would be ideally suited to make small evening bags. Pearlflex is light, sturdy, flexible and it able to withstand low or extreme temperatures. The material is tested on water absorbency and UV exposure to ensure quality. You can check out its technical specifications at the Materia database. When Did 3D Printing Become the New Jargon Term? Somewhere in the last five years, 3D printing has become the hot new jargon term. And now every English major out there who wants to build a following is flinging the term about with mad abandon and no real understanding that not every 3-dimensional object out there is created with 3D printing. I was first exposed to the concept of 3D printing at an exhibit at the FIT museum space (~2004?). They had just mounted an exhibit about new designers coming out of Amsterdam (an aside here – I’m not sure what all those designers in the Netherlands are smoking but their creativity is astonishing!). The exhibit included a number of really interesting artifacts including furniture and jewelry created through a process called ‘laser sintering‘. One piece in particular made a big impact on me; it was a necklace that had been created in situ inside its carrying case. Laser sintering is a type of manufacturing that uses laser energy passing through a container of special powdered substrate. A special software program creates a design file of ‘layers’ of the desired 3D object. The design file layers are the guides for the laser beam to create the 3D object. Being naturally curious I loved the whole idea, but laser sintering devices were certainly not cheap and not common. Even during my most recent degree program at FIT, where I studied accessories design, we did not have access to any sort of 3D printers. They were just too expensive. Moving ahead to 2008, and a nifty small business called Desktop Factory. Desktop Factory had a functional prototype of a true desktop sized 3D printer. It had a speed of about 1 cubic inch/1-3 hours, and a consumable cost of $1/cubic inch. They were planning to launch it at $4,995/unit. Unfortunately, 2008 was a wintery year for venture capital, Desktop Factory was unable to close funding (they came so close, so many times, but the venture capitalists out there, being the visionary sorts they are, rolled a one. Yes, suits, I’m talking to you.) and ultimately this technology was sold to another company. Fast forward to February 2010, Fashion Bar Camp, and the guys from MakerBot were demoing a Thing-O-Matic. (I think it was this one shown in Wiki, in fact). Fascinating? You bet. Useful to John Q. Public, not so much, unless you were also into DIY making. MakerBot was sold as a kit, for a little under $1,000. You had the ultimate DIY project to create your very own 3D printer. I thought about getting one (hey, I’m a technical designer. I make stuff all the time. How hard could it be, really?) but ultimately that $1,000 price tag for a bunch of parts put me off. Still, it was intriguing enough that they sold 3,500 units. It was also interesting that initial cost and consumable costs were starting to converge to cheap. Two and a half years later, ‘suddenly’ there’s a $2,500 desktop printer out there; costs of consumables are plummeting, and everyone is on the 3D bandwagon. It’s gotten so bad that I actually ran across a blog post claiming that biotechnology used to create muscle fibers was ‘3D printing of steak’. Additive manufacturing (AM) also known as 3D printing is defined by ASTM as the “process of joining materials to make objects from 3D model data, usually layer upon layer, as opposed to subtractive manufacturing methodologies, such as traditional machining. Synonyms include additive fabrication, additive processes, additive techniques, additive layer manufacturing, layer manufacturing, and freeform fabrication“. I did not make up this definition. It’s the ASTM International’s (American Society for Testing and Materials). If you played very fast and loose with all of the words in the definition, and stretched the actual meaning to the breaking point, you could conceivably say that all forms of making stuff are ‘3D Printing.’ I mean, when I make samples, it is technically accurate to say I take layers of materials and join them together in a process that results in a 3D object. But I really think it would be much too hard a stretch to say that creating a prototype sample with my sewing machine is 3D printing, even if every step of the process up to actually stitching the sample has been touched by technology. (And yes, I do start from a 3D model and end up with a 3D model). Given my science background (at the University of Michigan I doubled-majored in scientific illustration and botanical biotechnology back when Murashige-Skoog was the hot new jargon term) I think it’s stretching to call culturing muscle fiber in vitro ‘3D printing’. There’s also a ton of other crap being dumped into the 3D bin, because 3D printing is the latest jargon. Unfortunately, as any good technical designer can tell you, methodology matters, materials matter, and so does technique. Making sure you have the right words to describe how you want something made is as important as the sketch you send along, or you get back a sample that is the factory’s best guess. This is not to say that companies out there aren’t using 3D printing. Nike, Adidas and UnderArmour are companies that are all known for their high standards in development. Increasingly it seems that fashion designers are going to need to take their ability to think in 3D and use it to develop their design files in 3D packages so we can send them to 3D printers (which will be things, not people). So let’s get it right with 3D printing, and not just use it as a jargon term. It means something a lot more specific than that. This isn’t particularly fashion related, but the underlying technology is very interesting because my personal gut instinct is that we will move more and more to different kinds of 3D printers and away from mass complex manufacturing. Some researchers at Institute for Advanced Architecture of Catalonia (IAAC) invented a 3D printer that uses local substrate (otherwise referred to as soil) to print functional objects. The functional prototype printed several samples of structures including stools with and without supports. The concept was to create a 3D printer that could create architecture such as shelters from the materials on site, working from a digital file. Many 3D printers require an actual 3D object to copy, so this is a step forward in that the IAAC printer uses a software file it reads to generate the output object. Another advance forward is that the prototype has a ‘robotic arm’ that lets the printer print both vertically and horizontally – sort of like the paint robots in auto factories. This is an exciting development for a number of reasons. As I mentioned earlier, my personal vision for apparel is to have local ‘factories’ of small 3D printers of various sorts where community members could go and have their digital files read in and output a new garment or accessory. Imagine designing a sweater and going to a local factory, booking time on a knitting machine and being able to have your design created for you on a time and materials basis. You the consumer would no longer be paying for all the related subcosts of mass development; your transportation and customs costs would be largely eradicated, especially if you used yarns and threads there were locally grown and spun. It’s hard for consumers who don’t develop mass products to understand the ‘multiplier affect.’ But suffice it to say that just cutting out the transportation costs of overseas productions alone would have a huge impact on the environment because the quantity of oil required to transport mass-produced goods. So even if you paid a little more for your knitting machine time, you’d ultimately end up paying less for your product; it would b ea higher quality garment (you’d be right there watching it get printed, all eagle-eyed watching for mistakes); and you’d be doing the environment a favor since you’d be personally reducing your carbon footprint. But before we can get to that vision, we need good, effective 3D printers. This was why the IAAC prototype is so exciting to me. It’s one more step to getting there. And if it turns out that it can in fact actually be used to print shelters for people in places where architectural build materials are difficult to get, then we’ve moved humanity forward in a big way. Way to go, IAAC researchers! I read this awesome article over on the IEEE Spectrum web site about a new pressure-sensitive membrane that was announced by researchers at the Seoul National University’s Multiscale Biomimetic Systems Laboratory. This new material is cheap compared to current systems. The small size and use of platinum in the membrane’s manufacture means that ‘cheap’ is a relative term, but think about the potential uses for something like this in apparel – it’s so sensitive it registers the slightest touch – whether from rain, wind, or a physical touch from an animal or insect. Applied to performance wear, it has the ability to sense surrounding weather conditions and register changes of the environment…and hooked up to other wearable devices, make changes in a garment. Can you imagine a brand patch made of this membrane that registers the presence of water droplets, and can then instigate changes in other materials in the outer performance shell such as to increase its impermeability to water? I love how the membrane itself is ‘created’ by naturally occurring physics, e.g., the sheets of cilia are held together by Van der Waals attraction. I have to confess my technical designer mind really goes into high gear thinking about how this membrane could be put to work and how a garment could be built using this material to help make an even higher performing performance garment! Virtual goods are hot, and 3D is even hotter! In this 45 minute presentation, new methods of marketing, sales and development using 3D will be showcased. You’ll learn about a sizzling new way to showcase your work using 3D in a 24 x7 virtual fashion show. Pick your models, pick their looks, pick your runway, and then select the outfits, garments or accessories you want to showcase..it’s that easy. Want to go deeper? How about easy-to-use product demo stations, where your buyers can interact with your product offerings, changing colors and patterns. Want even more? Your buyers can purchase your product directly from the runway; look at tech packs, or anything else you want to show them. Your buyers are overseas or not easy to reach? No problem. If they have a web-enabled or mobile device, they can get actual videos of your product. Join us for this visionary approach to marketing your product, and be at the forefront of trend. CEO Shenlei Winkler presents “Virtual Fashion, Real Money” in this 45 minute demonstration at FashionCampNY. Fashion Camp is a free, volunteer-run, 2-day barcamp-style conference with workshops and presentations focused on current topics in fashion, technology, and innovative marriages of fashion and tech, including fashion tech/wearables, fashion eCommerce, and fashion2.0.